Preventing stains on clothing can be achieved in several ways, including protecting clothing and proper pretreating of spills prior to washing. This is a guide about preventing stains on clothing. When you need to protect your clothing while eating, use a towel with binder clips as a "bib". Ive just started back at school for year 12, and the uniform is a white blouse and black skirt. 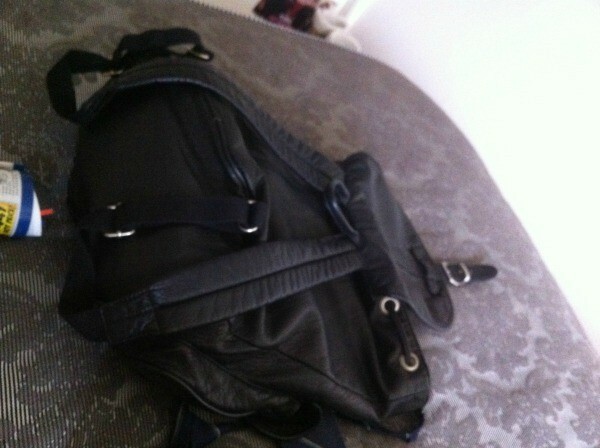 However, I bought a new backpack for school, it is unfortunately fake leather and black. When I use it, which is everyday but weekends, where the straps go they leave black on my shirt and it is really hard to wash out. I love the bag and I have already swapped it once and don't want to again. Help! I would suggest lining the straps that come into contact with your blouse with a fabric such as denim or fleece. Just cut strips the same width as the straps and use fabric glue to glue the strips to the straps.